MOSCOW - The decision by the world's wealthiest industrial nations to help Russia dispose of its arsenal of nuclear, biological and chemical weapons won support from some quarters here on Friday, but angered others as a sign of Russia capitulating to the West. MOSCOW (Reuters) - Russian President Vladimir Putin won the prized trophy of Group of Eight membership at a summit in Canada, but some back home still wonder how a country so poor could be a true member of the rich nations' club. MOSCOW (Reuters) - Russian lawmakers gave their final backing on Thursday to a Kremlin-sponsored bill aiming to clamp down on extremist activity, despite liberal concerns that the law lacked safeguards to prevent abuses. The All-Russian Democratic Party YABLOKO supports the foreign policy course of the President of Russia. According to YABLOKO, the main domestic problems are attributable to the inefficiency of the authorities and their inability to manage issues that are key to the future of the country. Such estimates were provided during the meeting of the Federal Council of YABLOKO, which took place in the Moscow region on June 15-16 2002. By Yevgenia Borisova. The Moscow Times, June 24, 2002. After six hours of half-hearted debate, the State Duma approved a bill in the crucial second reading allowing Russians to buy and sell farmland and restricting foreigners to 49-year leases. Liberals slammed the limitation on foreigners. The only protest from the Communists, who oppose the sale of farmland altogether, came from a crowd of about 200 people rallying outside the Duma building. Most lawmakers appeared to be more interested in following two World Cup soccer games that were being played, and the Duma hall was all but empty during the debate. St. Petersburg. June 25, 2002. "It is difficult to talk about a lack of understanding of the President's ideas by the political elites, said Mikhail Amosov, Chairman of the St. Petersburg branch of YABLOKO to a Rosbalt correspondent.— This immediately leads to the following question "what is a political elite?" Duma Passes the Law "On Combating Extrimism"
The second reading of the law on extremism took up half of the State Duma deputies' plenary session on June 20. Opponents kept warning: the notion of extremism was not clearly defined and this vagueness untied the hands of the Prosecutor General's Office and the Justice Ministry in their search for internal enemies. However, the State Duma supported the draft law initiated by the president as usual. The voting went as follows: 272 deputies (against a required number of 226) supported the law, whereas 126 rejected it. Consideration of the draft law started haphazardly before discussion of the first item - the notion of extremism - was closed. However, the deputies cleared everything out within two hours. The Yabloko faction succeeded in passing a number of principled amendments to the draft law "On Combating the Extremism "
On Friday morning, a mini-conference of the "most bourgeois" party - the Union of Right-Wing Forces (SPS) - will open at a luxury hotel in central Moscow. This will be a mini-conference because formally this party gathering is called the council of the party. Representatives of all the regions, all the members of the Duma faction, and all the leaders will be present. The SPS leader Boris Nemtsov is going to propose two major innovations, which are supposed to change not only the SPS, but the entire right-wing opposition. By Yelena Tregubova. Kommersant-Vlast, No. 23, June 2002. The Speaker of the State Duma Gennay Seleznev announced last week that he intends to develop the Rossia movement into a real political party. If he succeeds, Rossia will essentially become a second communist party, a sort of carbon copy of the CPRF. Actually, this fits in with the logic of President Vladimir Putin's actions, who seems intent on running the country with the help of a system of duplicates. 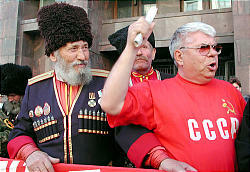 Boris Nemtsov, leader of the Union of Right-Wing Forces (SPS), proposes that all democratic forces agree to back one candidate for president after the parliamentary election in 2003. The formula is simple. Each party nominates its own candidate. The Duma election shows who has won. All democratic forces support the candidate whose party gathered the most votes, even if they actually dislike that particular candidate. MOSCOW, June 20, 2002. /RIA Novosti correspondent Galina Filippova/-- The Yabloko faction in the State Duma believes it is necessary to pass a Law on Combating Extremism "in view of the outbreak of extremism and signs pointing to the formation of an extremist underground in Russia." Sergei Mitrokhin, a member of the Yabloko faction, told reporters before the beginning of the State Duma's plenary session on Thursday where the parliamentarians were planning to consider in the second reading the presidential draft Law against Extremism. The leader of the YABLOKO party Grigory Yavlinsky advocates a change in Russia's political course. "It should be changed," Yavlinsky said at the meeting of the Federal Council of YABLOKO on Saturday, which was broadcasted by the Ekho Moskvi radio station. 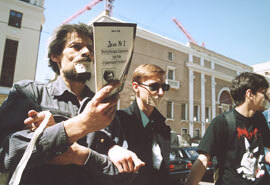 Different public organisations in Moscow have set forth the initiative of conducting an assembly of the democratic public of Moscow. The assembly will discuss the increasing xenophobia in society, growth in inter-ethnic conflicts, increasing activities of extremist organisations and inadequate reaction of the authorities in such a situation. By Oksana Yablokova. The Moscow Times, June 20, 2002. After four hours of heated debate, the State Duma approved the government-backed bill on alternative military service in a crucial second reading Wednesday, tweaking it only slightly despite a protest from liberal lawmakers that it remained draconian. About 300 amendments -- mostly from the liberals -- have been submitted to the Duma since the bill was passed in the first reading in April. However, the four pro-Kremlin centrist factions that form the Duma's majority blocked the passage of most of them. Few Guarantees in the Law on Elections. The Federation Council reluctantly passed a law "On the main guarantees of electoral rights and the right to participate in referendums for citizens of the Russian Federation". Most senators abstained. A controversial presidential bill on combating extremism was pushed through the State Duma by On June 6 the Duma resolutely voted in favour of a law to counter extremism in the first reading. The law was passed despite its clearly draft" nature and the views of some parties that this law could be used to put pressure on parties and social movements. The political situation in Russia was seen to demand it. WASHINGTON -- Thirty years after taking effect as a bulwark of Cold War deterrence, the Anti-Ballistic Missile Treaty expired Thursday, freeing the United States to pursue aggressively its goal of a multibillion-dollar defense system against enemy missiles. As Moscow cleaned up the mess left by rampaging soccer fans, the city police took the heat Monday for failing to foresee and avert the riot, and opposition political parties voiced fears that the Kremlin may use the street violence as a pretext for curbing civil liberties. Moscow, entrance to the Federation Council. "Small business involves hard labour, rather than business." At least that is how Deputy Head of the Yabloko faction in the State Duma Sergei Ivanenko sees it. What Future for Russo-Ukrainian Relations? Ukrainian President Leonid Kuchma arrived in St. Petersburg on Sunday for a summit meeting with President Vladimir Putin. A controversial presidential bill on combating extremism was pushed through the State Duma by Deadly Riot Erupts After Cup Defeat By Nabi Abdullaev and Natalia Yefimova Drunken soccer fans rioted in downtown Moscow on Sunday, leaving at least one man dead and dozens injured, in the worst street violence the capital has seen since the bombing of the parliament building in 1993. A controversial presidential bill on combating extremism was pushed through the State Duma by pro-Kremlin factions Thursday, despite criticism from the Communists, liberal lawmakers and human rights advocates, who say the measure will give the government too much power to suppress public protest. Ending an almost two-year struggle to chose a date for elections to the St. Petersburg Legislative Assembly the Chamber Assembly on Wednesday passed an amendment to the City Charter setting out Dec. 14 as the date for the vote. ABN. June 3, 2002. St. Petersburg. 20:02. Head of the State Duma Committee on Education and Science, deputy of the State Duma from the Yabloko faction Alexander Shishlov, advocates the introduction of a single state examination: he also thinks that a federal law should be adopted in connection with this. Grigory Yavlinsky is very much like his electorate. This is his vice. But then, the same holds true about his electorate. President Putin's generation came to politics in the late 1980s. 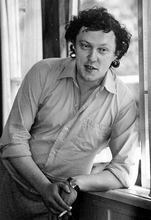 Grigory Yavlinsky, Yegor Gaidar, Anatoly Chubais, Nikolai Fyodorov, Boris Nemtsov, Irina Khakamada and Yuri Boldyrev are inordinate people filled with ideas to bursting point, who inspired the love one feels for pop stars. Despite their different ages and likes, they had many things in common. Aged 30 to 40, none of them had any experience of party or Soviet work. They have graduate and post-graduate degrees and significant expectations and ambitions. Liberal politicians and human rights activists urged for the passage of a bill that would allow independent inspections of prisons and visits to inmates Wednesday, saying such visits would help root out prison abuses...Yabloko party leader Grigory Yavlinsky said Wednesday that one reason the bill has gotten bound up in red tape is because of the peculiarities of existing legislation, an eclectic mix of Soviet-era laws that put the state's interests over those of individuals and newer laws that try to respect human rights. "This is why [the government] says the bill contradicts so many laws," Yavlinsky said. "This bill, together with the bill on alternative military service and attempts to implement a ban on the death penalty, demonstrates that our legislation is developing in between these [Soviet and post-Soviet] principles." Decision #61-1, May 24, 2002. 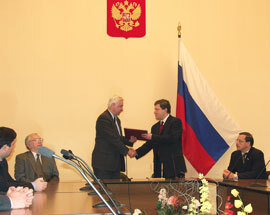 After reviewing the issue on the principles for forming the federal budget for 2003 with regards to the financing of education expenditures, the Committee thinks that when drafting the federal law "On Federal Budget for 2003" the Government of the Russian Federation should make development of education a priority issue and consider the provisions aimed at developing the education sector contained in the Address of the President of the Russian Federation to the Federal Assembly of the Russian Federation, materials of the discussion "Modern Education Policy of Russia" from the meeting of the State Council of the Russian Federation, the Concept of Modernisation of Education in Russia for the Period Until 2010 and the National Education Doctrine. Experts gathering Thursday on the heels of three major international summits said the West's leading policymaking institutions must include Russia in a broad strategic framework if they want to successfully tackle the top global priority: terrorism. Despite that general consensus, there was stark disagreement on specifics at the two-day conference on Euro-Atlantic integration, organized by the Washington-based Euro-Atlantic Institute of International Integration Studies.